Cardionics N.V. is opgericht op 30 april 1969 door het Belgische bedrijf Union Minière. Het doel van Cardionics N.V. is de toepassing op de geneeskunde door computer en elektronische middelen, in het bijzonder de elektrocardiogram. Cardionics N.V. heeft een ECG programma verworven, door IBM ontwikkeld in samenwerking met een groep Amerikaanse cardiologen Mount Sinai Hospital (New York) . Chromalloy American Corporation zorgde voor de verdeling van dit ECG systeem (software en hardware) in de Verenigde Staten via haar dochteronderneming Cromed. In 1979 heeft Cardionics de rechten verworven van Cromed voor de wereldwijde distributie. Since 1992, the main shareholder is BGI under the name of of Cardionics Invest. Since the beginning of its activities in Belgium, Cardionics was able to establish privileged relations with University Hospitals in Belgium such as ULB Erasme – UCL KUL (RUG) – ULG (Liège) – VUB (Brussels). 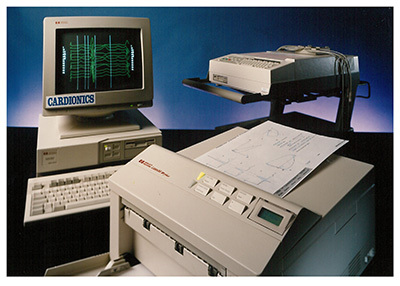 In France, Cardionics collaborates in all Congress of Quantitative Electrocardiography in which Vectorcardiography and averaged ECG (Late Potentials) computer held a prominent place since 1983 until 2001. With this scientific recognition and the development of CarTouch device CARDIONICS S.A. could enter the market of clinical trials for pharmaceutical companies. CARDIONICS S.A. continues to evolve in the electrocardiographic sector (software and hardware), and through effective partnerships, puts its expertise at the service of new applications (Telemedicine and sports medicine). In 1992 Cardionics S.A. developed a 15 leads ECG acquisition board, The CardioLogic 15, which installed in a PC, transforms the computer in a powerfull ECG with memory. This evolution interests private cardiologists, hospital centers and preventive medicine centers. In 2001, the 12 leads ECG device CarTouch was designed to perform an autonomous acquisition, ECG storage and transfer via internet (Telemedicine) to the ECG Central Lab. Launched in 2002, the 15 leads CardioPlug, records ECG in a slave mode to PC and provides access to all the performance of the PC (speed, memory and network). The CardioPlug replaces the internal circuit board CardioLogic15 and runs on Microsoft Windows. Alongside the development of the ECG medical equipment, software is adapted. Cardionics SA developed in 1988 the 3 leads XYZ Stress test on Microsoft Windows using the CardioLogic15. New 15 leads ECG analysis software. This new version was presented at the “XXI International Congress on Electrocardiography” in Yokohama in July 1994 and a abstract was published in the “Japanese Heart Journal” (Vol 35 Supplement 1994). 1994, Ventricular Late Potentials software on Microsoft Windows. 2000, Cardionics S.A. developed a new ECG interpretative software for 15 simultaneous leads (12 ECG + 3 VCG) for the CarTouch and CardioPlug devices. 2000, Cardionics S.A. launches the Pharma Software Suite including the precise QT calculation for the Clinical Trials. Cardionics established strong partnerships with CRO (phases I and IV). At the same time, Cardionics S.A. developed essential software for the integration of ECG’s in the Hospital network and the ECG transfer to Central Labs. 2009, development of teh ergospirometry VO2Max in partnership with MEC (www.mecrd.eu). Demand for our products has increased with the widespread use of computers in hospital medicine. 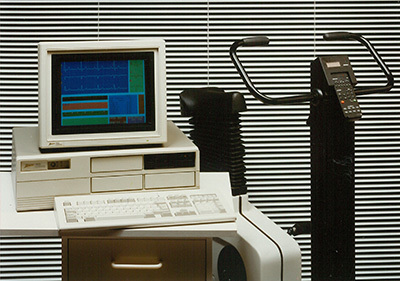 From 1969 to 1985, the centralized ECG processing on IBM360 involved the installation of analog recorders in the hospital, transferring ECG analog data by phone, reception and A / D conversion at Cardionics center, IBM treatment of the digital tape and return by mail within 24 hours of ECG acquisition. This approach interested cardiologist for ECG monitoring of hospitalized patients. With the arrival of IBM PC Compatible, the possibility of processing the electrocardiogram also interested surgeries in order to immediately dispose of the ECG measurement and diagnostic. For this reason Cardionics developed the CardioLogic, an sophisticated ECG recording circuit with a / D converter (12 D). The enthusiasm of private practices for the PC increases with the first digital solid memory Holters (24H) that can gradually replace the treatment of tapes. A combination of digital ECG and Holter seduced private cardiologist. The progressive development of Hospital Information Systems allows the intergration of ECG’s in the patient records. With new products and several technical and commercial partnerships for distribution, Cardionics SA expands its prospecting area to external markets with a full range of products including ambulatory ECG monitoring for postoperative rehabilitation cardiology, holters, ABPM, tables and ergometers. Since 2005, with the participation at Arab Health Fair, Cardionics S.A. has conducted operations through distributors or directly to external markets of the Middle East and North Africa (Qatar, Marocco, Algeria, Tunisia, Egypt,…). From 2013, CARDIONICS S.A. initiates a commercial prospection in the Democratic Republic of Congo. To date, several hospitals and clinics are equipped with exercise testing and / or Holter whose Monkole Hospital, SOS Médecins de Nuit, Ngaliema Medical Center, Biamba Marie Mutombo Hospital and Ngaliema Hospital. In the US also, Cardionics equip a New Phase I Center for Clinical Trials in 2015.